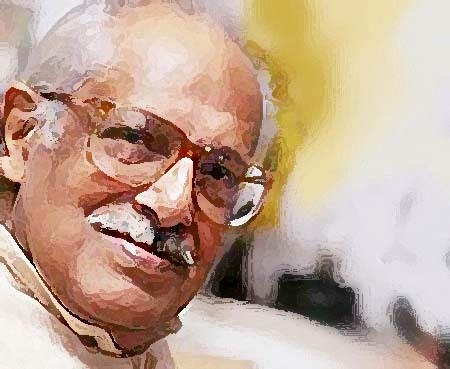 Art Blogazine: E-News Magazine update: Hrishikesh Mukherjee: A Counselor in disguise of a Director. Hrishikesh Mukherjee: A Counselor in disguise of a Director. Art is reflection of society. I have been writing about various genres of art and find that every genre is interrelated. Visual 2D can be animated in motion media in 3D form. The society that reflects in cinema can be captured on canvas or paper by a painter. Dance can project a whole life of a particular character. Songs emote various emotions and feelings and so on. Today the movies of Hrishikesh Mukherjee kindled me to write about his non glamourized directorial brilliance. Hrishi-da, as he was lovingly called in Bollywood is a well-known and one of the most loved directors. He is a common man’s director. Though he is dead I still feel his presence through his cinema. And it is also a well-known fact that an artist never dies, he lives in his art, so do Hrishi-da. The magical effect continues to linger over our minds through his awesome movies like, Chupke Chpuke, Bawarchi, Khubsoorat, Satykam, Aashirwad, Guddi, Mili, Anurdha, Abhimaan and others. These films are amazing and mind blowing even though non-glamorous. These films bind us with warmth and simplicity. I do not wish to analyse his movies into comedy and serious dramas, instead I am presenting the common thread that runs through these films. The most common factor is his association with common man’s life and that makes us relate to his films. Why do I call him counselor? Because, I had read somewhere that Hrishi-da had said that he would better have been doctor than a film-maker. I think he was not less than practicing doctor. He touched human mind and psyche. He understood human nature better than any film maker. His observation and analysis is closer to that of psychologist. His every film touches upon both these aspects and a viewer tends to learn or take a healing dose from it. To start with, the best example is ‘Anand’ where he subtly suggests to live every moment happily even if under distress, here critical ill Anand (played by Rajesh Khanna) shows the spirit of living. It is like practicing happiness, or controlling your own happiness in transitory feelings and circumstances. No one is perfect. The imperfection of human nature is perfectly projected in his film ‘Anuradha’, a story of an idealistic doctor who neglects his wife or Ashok Kumar in Satyakam who has treasure of religious and philosophical knowledge but fails in practical life to accept his own grandchild due to wrong notion. The characters of all his films seem real. Many of the characters are the reel presentations of real life. According to his daughter-in-law Swati loves western music. Hrishida asked her about Ustad Zakhir Hussain, she showed her ignorance of Indian Classical music and told him that Ustad was very famous and very handsome. Hrishida was shocked at her knowledge of Indian music. He himself was very finely tuned in Indian classical music, the songs from his films are hummed till date. But who can ever forget the first Indian Rap song by Ashok Kumar, ‘Rail gadi, rail gadi…bich wale station bole ruk ruk ruk ruk…’? His films have protagonists who are staked by circumstances, but as human nature every person tries to win over negativities by hook or crook. Two realities of life are the recurring themes of Hrishi-da’s movies; Happiness and Death. According to him, all the attempt of humans is to make life happy and secondly, death is inevitable. Humour is followed by pathos and also there is a silver lining to every cloud. Unlike, main stream cinema which gives us larger than life picture and many a times unrealistic modus operandi, Hrishida lets us confront reality and accept the facts of life. Hrishi-da was a simple man in real life just like his simple films. He believed that artist reflects himself in his art. He followed his instinct to project common man, his feelings, deeds, follies and foibles and all the virtues that makes up his life. Simplicity has influenced almost more than three generations and even today’s techno generation is awed watching his movies. I think the mantra behind his dedication lies in his reflective thought: Your own glory is better than reflected glory. (As told by Swati Mukherjee, his daughter-in-law).